Lou Holtz, the legendary football coach said this,* and how true it is in the sales lead management industry. In spite of all of the software tools available and the lip service given to proving the ROI for sales leads, I see marginally few marketing managers step forward to actually prove lead gen ROI. They have good intent, they say they're going to get to it, maybe this year, as soon as the salespeople cooperate, but then again maybe next year. It’s discussed and hammered on in webinars, seminars and workshops, and by keynote speakers and vendors. It’s included in most proposals by CRM and marketing automation companies. So why is it talked about more than it is done? What this means for the marketing manager is that if the CEO has the guts to call marketing management in and demand an ROI or the marketing manager will be hanged (fired), it might clear his or her mind wonderfully well. • They don’t know how to measure the ROI. • They don’t want to measure the ROI for lead generation. • Being held accountable is not their first choice. • No one asked them to be accountable. • They don’t know it can be done. • Fear of the results. • They don’t have the tools. • They don’t know how to use the tools they have. • They don’t have control over salespeople who report on results. "In spite of this fear, doubt and uncertainty, I have seen very few lead generation programs that, when measured for sales results, fail to produce a sufficient margin to make the investment worthwhile." I believe that marketing managers must have the courage of their convictions to prove that lead generation budgets are well spent. Because the tools are there for measuring the lead generation ROI, it IS possible to measure it. This is settled science. In a previous blog entry, I said it’s “Time to stop cussing the mule and load the wagon.” It isn’t difficult; you just have to make the decision that you’ll do it to the best of your ability, stop talking and start doing. You’ll find your job to be more secure and satisfying when you do. and you may avoid a hanging in a fortnight. "You have to ask yourself, ‘Can I forecast the sales results for a lead generation campaign?’ “ If you can't, this is called gambling. Gambling is based on Luck and Marketing has no place for gamblers." Sunday Musings: Bodhidharma: All know the way; few actually walk it. This blog entry is one of our most read and visited. Bodhidharma was a Buddhist monk who lived during the 5th/6th century CE. (1) His famous words echo today for marketing. After the bruising, battering, beating marketers and their companies have taken for the last three years, and with all the seminars, webinars, books, articles and blog posts on how to measure marketing ROI, everyone knows the way to prove the ROI for lead generation programs, right? So if this is true, and everyone knows the way, why do so few take the walk? I think there is a dose of fear or anxiety over reporting results that might be mixed, and fright that if each lead generation program doesn’t do well, the whole department will be held dreadfully accountable. This program is an authentic, unscripted, exchange of ideas which broadcast live on October 8th, 2015. 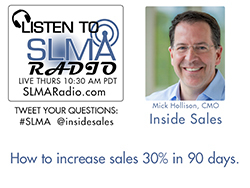 Increasing sales by 30% in 90 days is a bold statement and we asked Mike Hollison, CMO of InsideSales.com how it can be done. Of course following up all leads increases sales, but Inside Sales claims its self-learning engine drives predicative sales communications and engagement using Neuralytics®. Of all the reasons to install and use Salesforce as a CRM system, measuring marketing performance is one of the biggies. In this interview with industry veteran Bonnie Crater, CEO of Full Circle CRM, we explore how can you get intelligence to make decisions and not hum and haw when the CEO says, “What does Salesforce report on our marketing spend? Bonnie talks about marketing artists and scientists and who is most likely to want to be measured. Within the 25 minute interview she covers the five steps that marketing and sales must take to measure revenue from marketing. Winners never “try.” Winners only win. Trying is for Losers.